There are obvious winners in today’s news about Google acquiring Motorola Mobility for $40 per share, or $12.5 billion in cash. And there is no one more of a winner today than the iconic investor Carl Icahn. Carl Icahn owns 26.8 million shares of Motorola Mobility (NYSE:MMI). And when Google announced an acquisition of Motorola Mobility at a premium of $40 per share ($15 more than the closing price on Friday of approx. $25 per share), Carl Icahn made about $415 million in that transaction. I would say that Carl Icahn made a good decision in becoming a major share holder in Motorola. However, the acquisition of these shares occurred in 2006 and a lot of has been done since then to get Motorola to the level where it is today. 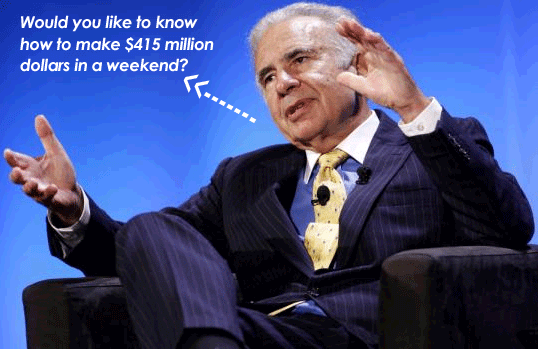 Regardless, Carl Icahn is now nearly a half a billion dollars richer!